Eco-tourism may be the hot new thing in travel across the U.S. and the world, but Cape Cod kayaking has been a popular way to explore the vast natural beauty of the areas inlets, marshes and bays for years. Take a look around Cape Cod and you’ll quickly realize that these beach communities are unlike most oceanfront vacation spots in America. No high rise condominiums, no dense beachfront development. Cape Cod has done a beautiful job of retaining its natural environment and appealing to vacationers at the same time. The easiest  and possibly the most relaxing  way to take it all in is by kayak. When you need a break from the crowds at Marconi Beach or Nauset Beach and you’ve had enough boutique shopping and ice cream eating, check out some of the Cape Cod kayaking outfitters and guides. They can show you a side of Cape Cods natural beauty you’ve never experienced before. Kayaking outfitters are scattered across the Cape. Many even have mobile operations during peak season. They’ll deliver your kayak to you! 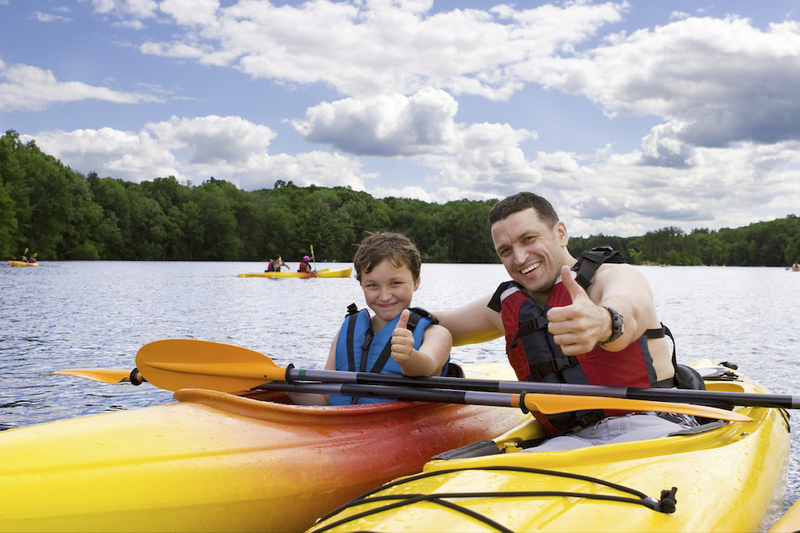 If you’re renting a kayak on Cape Cod, try one that is shorter than 15 feet with a fairly flat bottom for stability. 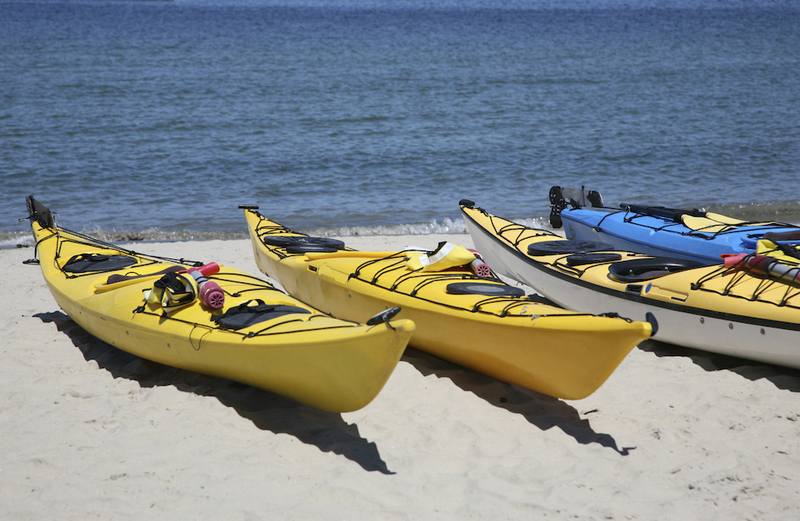 In a kayak that is two to two-and-a-half feet wide, you will be able to kayak just about anywhere on Cape Cod. If you have more experience and courage, try a longer, narrower kayak and head into choppier, open waters. A personal flotation device and a guide or a map  and youre on your way! 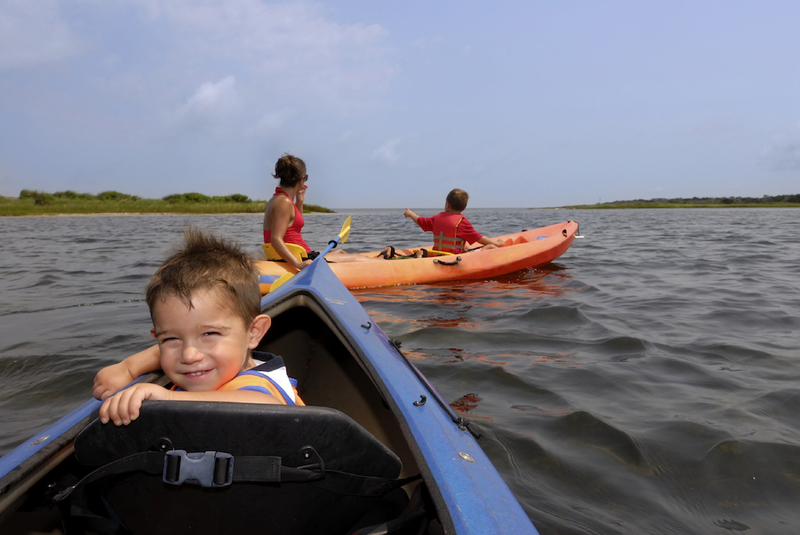 Depending on your kayaking experience and your sense of direction, you can rent a kayak and set off on your own to explore Cape Cods marshes, ponds, rivers and bays. A sure bet for a fun and relaxing day, however, is a Cape Cod kayak tour, led by a seasoned guide from one of the kayaking outfitters. Most outfitters offer several tours, each with different routes and different start times each day. A sunset kayaking tour of Cape Cod is an experience that cant be beat! From the Upper Cape to Provincetown, your kayaking possibilities are awesome! There are over 60 different kayaking routes to explore across the Cape. On the Upper Cape, kayak tours along the Mashpee River, in Wild Harbor and West Falmouth Harbor, and Scorton Creek in Sandwich are popular. Many Upper Cape Cod kayakers also enjoy relaxing kayaking in the waters of Waquoit Bay, a national research reserve, where they can also explore undeveloped Washburn Island where you can even camp right on the water!. On Buzzards Bay, kayak tours also run in the calm waters of Pocassets harbor near Bassetts Island. Some Upper Cape outfitters and guides also offer adventure kayaking to more experienced paddlers. These trips offer challenging kayaking in the more aggressive waters of the Nantucket and Vineyard Sounds. The tidal flow and rocky shorelines in some spots make these trips a little less relaxing than the marsh tours! In the Mid-Cape region, the Herring River in Harwich is a Cape Cod kayaking hotspot. Head upriver to the marsh and you may very well see egrets, great blue herons, and ospreys. Countless migrating birds and other marine animals visit Cape Cods shores each year. Kayaking on Cape Cod is the perfect way to see this wildlife. The Swan River, Swan Pond and the Nantucket Sound are also featured on many Mid-Cape kayaking tours. Meetinghouse Pond, the Oyster River, Pleasant Bay and Monomoy Island off of Chatham also make appearances on many summer kayak tour schedules. The Lower Cape features possibly the most spectacular of Cape Cods kayaking spots,  Nauset Marsh. Nauset Marsh is one of the most productive salt marsh habitats in the world. Its grassy sedge islands  known here as hummocks  are separated by shallow channels best navigated by kayak. These saltwater streams and tidal creeks are ideal not only for kayaking but also for birdwatching and otter-spotting. You may even run across sunbathing seals on Nausets barrier beaches. hose with some more advanced kayaking skills can slip through an inlet and into the Atlantic to ride the surf too (with a wetsuit and helmet). The beauty of Cape Cod kayaking doesn’t stop at Nauset. Keep heading north towards Wellfleet, Truro and Provincetown for more amazing kayak tours. Long Point and Pamet Harbor in Truro, Blackfish Creek and Great Island in Wellfleet and Provincetown Harbor are all hugely popular Cape kayaking spots. There are many kayak outfitters and tour guides to choose from on Cape Cod from Falmouth to Provincetown,  we’ve put together a pretty good list for you to consider. Some have two or three set tours, others offer different tours daily and travel up and down the Cape. All are more than happy to give some instruction to a novice Cape Cod kayaker. Tours range from two hours to a half day to a full day. Prices vary from outfitter to outfitter and tour to tour. Most seem to range from $25 to $60 per person, including the use of a kayak and accessories. If you dont need a tour guide, many places also just rent kayaks out for $25 to $45 per day. So, if you need a break from the beach, you’d like to spend a quiet day with your spouse, you need some good exercise or youre just looking for something to do which will not involve your kids begging for ice cream money, reserve a few spots on a Cape Cod kayak tour. Enjoy the spectacular beauty of Cape Cods ecosystem from a kayak  and relax. We hope that you find the information on Cape Cod kayaking useful. We are thrilled to be able to share our knowledge of the Cape with you. Please tell us about your Cape Cod kayaking adventures.